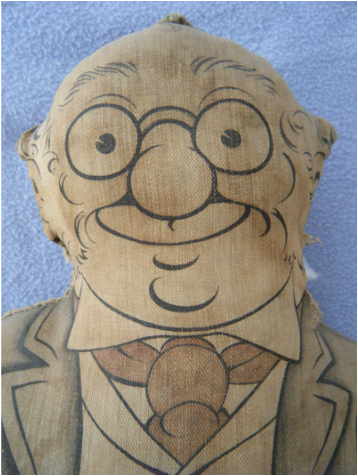 Foxy Grandpa is a stuffed doll made for my Grandmother by my Great Grandmother in 1901. Foxy Grandpa and his mate, Daisy, were passed on to my mother when she was a little girl. Sadly, Daisy was lost in 1933 when she was thrown out of a car window by my mother's cousin when the family was out driving. They went back to look for Daisy but she was never retrieved. We can only hope that she was recovered and cherished by another child. 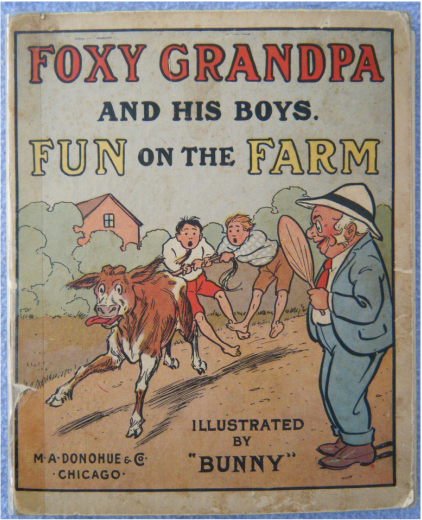 According to Wikipedia, the character of Foxy Grandpa appeared in newspaper comics in the early 1900's. 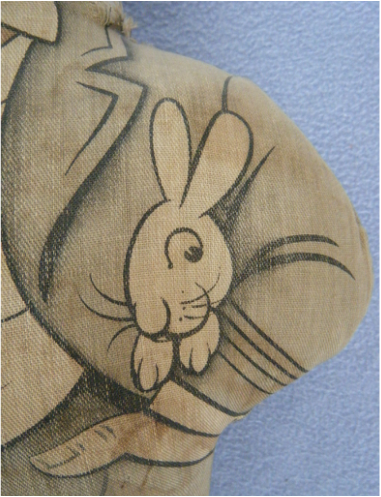 He was illustrated by Carl E. Schultze who used his nickname "Bunny" on his work. 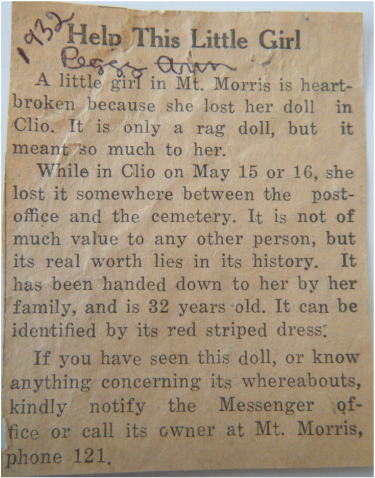 I have not been able to locate any reference to a Daisy doll and do not know what she may have looked like, or even if she was connected with the comic strip. A character by the name of Daisy Deane is listed in a 1902 broadway musical comedy about Foxy Grandpa. Foxy Grandpa is a well dressed fellow. Notice the rabbit under his arm. Foxy Grandpa has a kindly and mischievous face. There is stuffing peeking out of a split seam in his neck. He was refilled at some point by my mother. 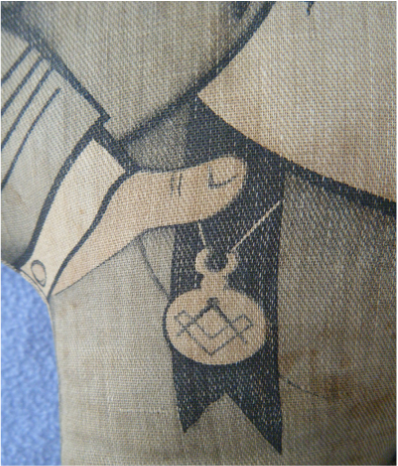 Apparently, Foxy Grandpa was a mason as he is wearing the square and compass logo. This is an update to the original story. When I next visited my mother, she pulled out this newspaper clipping from when she lost Daisy. 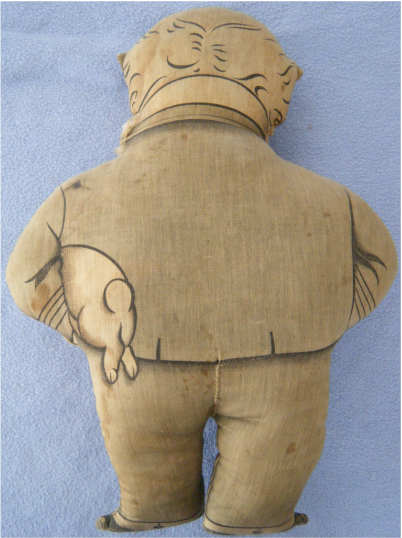 The backside of the rabbit appears on the back of the doll. He is stitched along the back of his trousers. My favorite feature is the rabbit. You can't help but wonder what type of adventures the rabbit must have been involved in. My mother has a book with a story about Foxy Grandpa. It is illustrated by "Bunny". 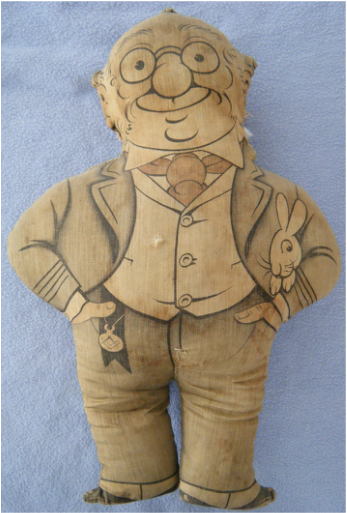 I wonder if there is a connection to the rabbit on the doll?